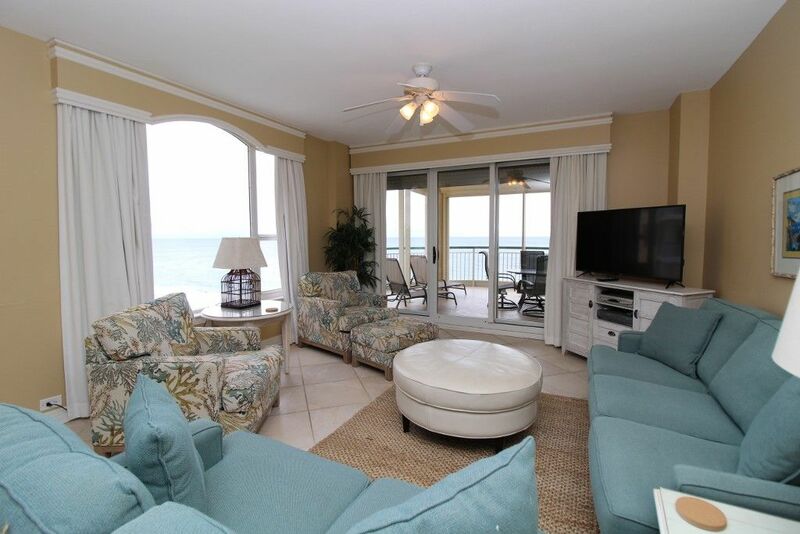 Beach Colony West 8A- Beach Front unit with large terrace & amazing views! This unit is located in the upscale beachfront property of the Beach Colony Resort, situated on the picturesque and quaint east side of Perdido Key. This beautiful, somewhat undiscovered area provides the ideal escape from the daily life and transports its guests into a relaxed atmosphere of sand and sun. Sparkling sugar-white sands give way to emerald waters, creating the perfect setting for a vacation you’ll never forget! Stunning beach views, an open and spacious floor plan and private balcony access from each room are just a few remarkable features of this amazing unit! Adorned in a beach-inspired shabby chic style, the space combines both elegance and comfort. The living area provides ample seating, with a plush sofa and four additional chairs with ottomans, and a large LCD television and beachfront balcony access! Floor-to-ceiling glass sliding doors open to the expansive covered terrace, offering an outdoor table with seating for four where you can enjoy your morning coffee, a glass of wine and even dine al fresco while delighting in the splendor of coastal living! Impress your friends and family by preparing a 5-star meal in the fully-equipped kitchen, boasting upgraded stainless steel appliances, granite countertops and a breakfast bar! The dining area affords seating for 4, with additional bar seating for 4. The master suite is equally impressive, boasting a king bed with luxury linens, an LCD television and beachfront balcony access! The attached master bath features an oversized jetted tub with gulf views, separate glass and tile shower and double vanities. The second bedroom offers a queen bed with quality linens and bedding, LCD television, private bath and north balcony access! The third bedroom hosts two full beds with premium linens, an LCD television, attached bath and north balcony access as well! Each bedroom was just updated with brand new Sealy Posturepedic mattress sets also! The Beach Colony Resort offers every amenity imaginable, including 2 outdoor beacfront pools, an indoor heated pool with a jetted spa, tennis courts, a state of the art fitness center and a charcoal grilling area. There’s plenty of recreation for the entire family to enjoy! If you demand luxury and comfort, our gorgeous Beach Colony unit will exceed your expectations. Visit Perdido Key and experience the vacation of your dreams. I loved the jetted tub overlooking the water and the curved balcony! The kitchen invited you in- so we actually cooked several nights instead of eating out. So fun to sit in the breakfast area and watch the ocean! Enjoyed watching the dolphins each morning and could see them from inside the condo in several places! Can’t wait to come back-There was plenty of room so we all felt spoiled. We are so happy that you enjoyed your stay with us and had a chance to see some of our local wildlife! We hope to host you again! A very nice place to stay. I would recommend it. Overall, we had a great experience here! The pools were very nice and the beach access was easy. The condo itself was very nice. The kitchen had everything we needed. The only bad thing I can say about it was the mattesses weren’t that great, but not bad for a weeks stay. We would stay here again! I would also highly recommend Cold Mil Dolphin tours while you’re there. We wanted to thank you for providing feedback about your recent visit with Luxury Coastal Vacations! We are ecstatic to hear your stay was enjoyable and the unit met your needs, and we appreciate you taking the time to share your thoughts and experiences with us! We stayed at Beach Colony West 8A for a family vacation with four kids ranging from 4 to 17 years old. The location was convenient, the condo was well furnished and kept up nicely, and the facilities gave us everything we needed. The view of the ocean was beautiful. It was just steps away from the condo. We spent every morning at the ocean and afternoon at the pool. It’s definitely worth renting an umbrella and chairs for your stay if you don’t bring them with you. You can rent them right on the beach from a company who sets them up each morning. The condo had all the cooking equipment we needed, so we were able to eat most meals there. We had a maintenance issue while there, which was fixed promptly and politely. I would definitely recommend this condo for your next beach vacation. Thank you so much for your kind words! We are so glad that you enjoyed your stay with us at the Beach Colony property and our little piece of paradise. We hope that you come back soon! Beautiful views, condo was clean and nicely decorated. We had a wonderful time. Thanks so much for sharing your space with us. Thank you for choosing to be our guest in this beautiful Beach Colony West 8A condo! We are so happy to hear you enjoyed your stay! We hope to have you join us again in the future! The property is well maintained and has a very secure environment. All the amenities we were looking for in a family vacation. Thank you for your lovely review! We strive to always provide top notch service and hope see you again in the future! Everything was great. The view is awesome. Nice touch with the essentials. We had everything we needed and says a lot since our group was 5 women all in our late 50’s . Nicely decorated. An interesting Naval Aviation Museum is located minutes away from Beach Colony and offers exciting activities including an IMAX theater and a flight simulator. The fun-filled, family-friendly water-park Waterville is also located nearby.